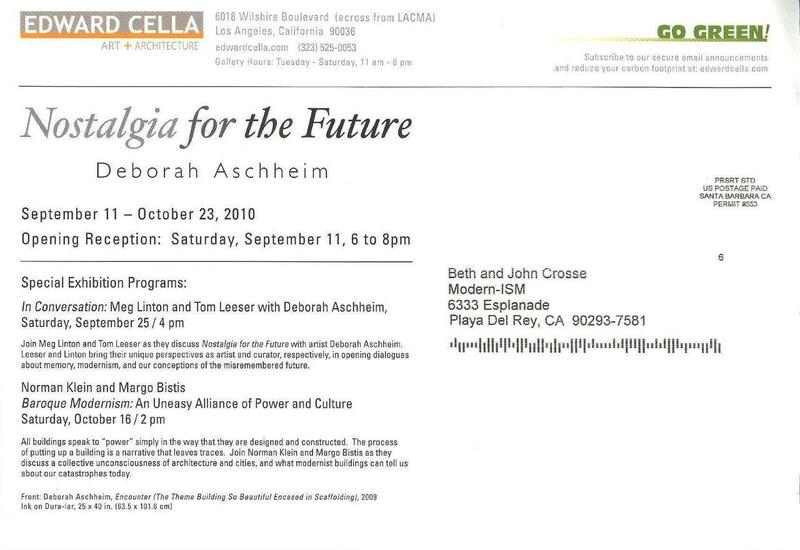 Deborah Aschheim Studio prepping for the Nostalgia for the Future, downtown Los Angeles, 1010. Photo by Deborah Aschheim. Los Angeles-based artist Deborah Aschheim will be featured in a stunning solo exhibition of new work opening with a reception at 6:00 p.m. on September 11th at the Edward Cella Gallery, 6018 Wilshire Blvd. across from LACMA. Aschheim states, "When I was growing up, the future was limitless possibility, jet-age, space-age, techno utopia. 'Modern' meant new. Now, modern means old and the future I grew up with seems dated, irresponsible, and obsolete. ... When I encounter these endangered or ruined monuments to the future from the past, gutted or restored or covered in scaffolding, I am moved beyond anything I can explain. I have a feeling of time travel. I feel sentimental about buildings I am not sure I would have liked when they were new." I had the pleasure of meeting Deborah after Frances Anderton's compelling "Conversation" with Fred Fisher in conjunction with his fascinating show "Frederick Fisher: Thinking by Hand" at this same Cella Gallery. (See my related post at Frederick Fisher). Edward has a wonderful knack for putting together extremely stimulating panel discussions in conjunction with his shows which has resulted in the creation of one of the better salon-like atmospheres associated with any gallery in Los Angeles. Knowing of my interest in architectural history, Edward came up to me after the Anderton talk and said, "I have someone you should meet" and proceeded to introduce me to Deborah. 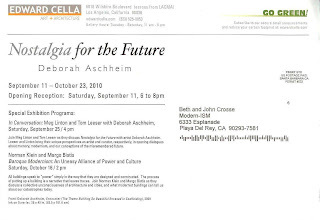 Deborah's ensuing description of her recent architecturally-based work and upcoming show immediately piqued my interest. After visiting her web site http://www.deborahaschheim.com/projects/on-memory/nostalgia-for-the-future and seeing her LED-illuminated model above of the Theme Building at LAX, my excitement level increased as I had recently been spending some time with one of the original designers of the building, renowned 94-year old structural engineer Richard Bradshaw. I learned of Richard while conducting architect William Krisel's Oral History interviews and organizing his archives for recent acquisition by the Getty Research Institute. 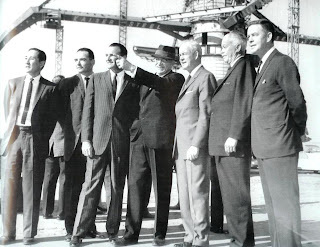 Krisel met Bradshaw through taking his course designed to prepare architects for the structural engineering portion of the architectural licensing examination circa 1949. 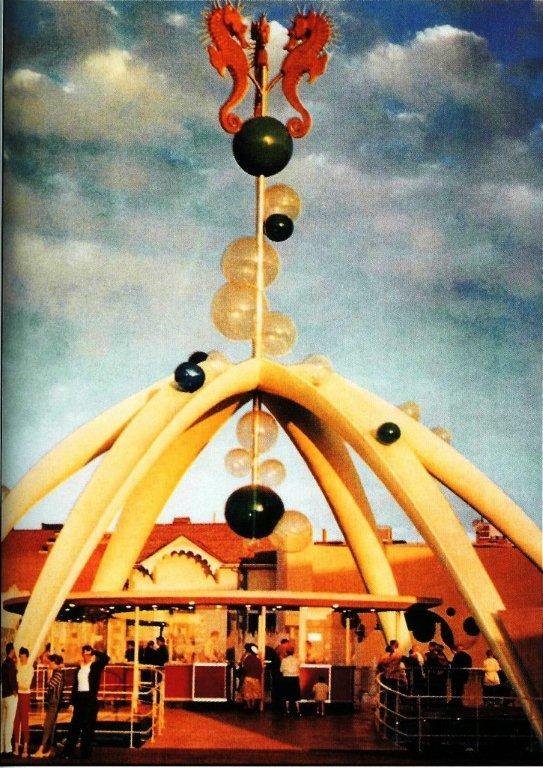 Krisel later hired Richard to help create some innovative designs in the early1950s. Film maker Jake Gorst and I met and interviewed Richard while filming a documentary on Krisel's life which premiered in Palm Springs last February. There is footage of Richard and myself in the trailer at the following link. 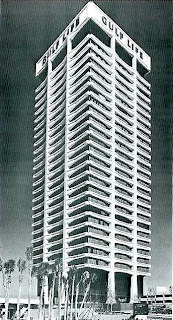 (William Krisel, Architect). Chanin Hale directing Richard Bradshaw for cameraman John Crosse. Deborah Aschheim photo, May 25, 2010. 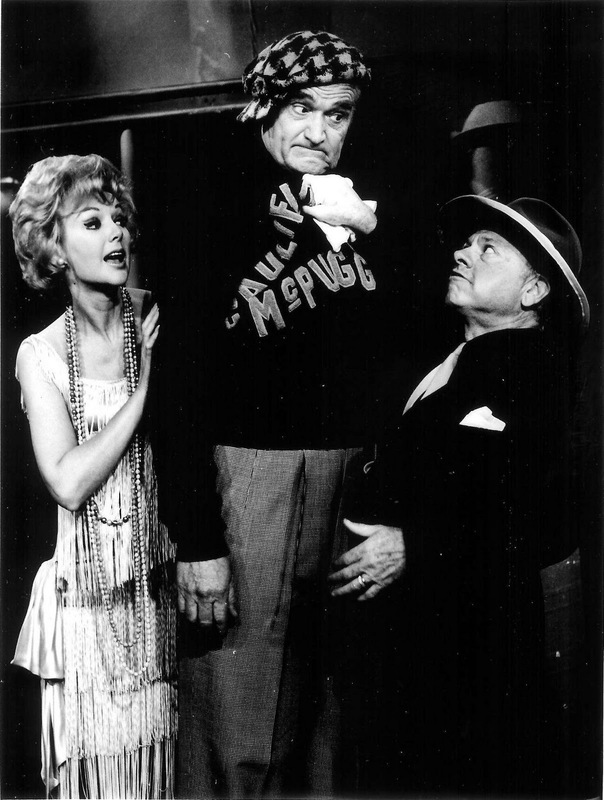 Chanin Hale (Bradshaw) with Red Skelton and Mickey Rooney circa 1965. Photographer unknown. Courtesy of Chanin Hale Bradshaw. Paul R. Williams in front of the Theme Building. Julius Shulman Job No. 3946, Oct. 21, 1965. From the back cover of The Will and the Way: Paul R. Williams, Architect by Karen E. Hudson, Rizzoli, 1994. Courtesy Getty Research Institute. Julius Shulman's now legendary images of the buildings of Los Angeles have become deeply ingrained into our collective psyche. 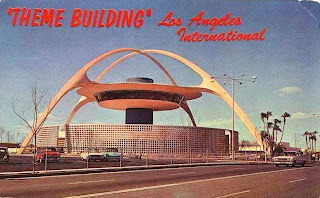 The image above has become so iconic that most people have a deep belief that Paul Williams was the architect which could not be further from the truth. Pereira & Luckman was the architectural firm responsible for the design with structural engineering performed by Richard Bradshaw. 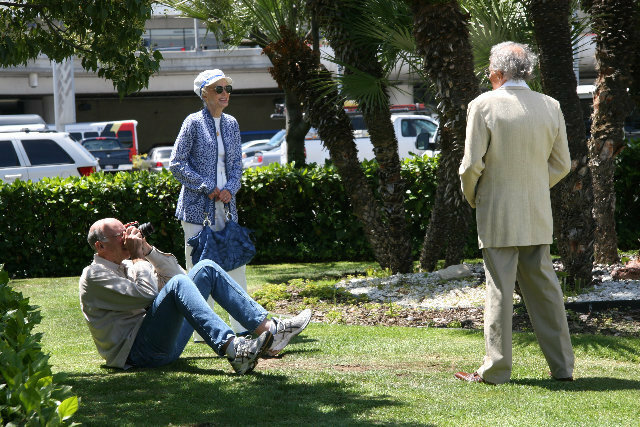 In an interview with the author, Shulman stated that this was the photograph he most regretted taking because of the resultant myth it created. The above photo taken with a super wide-angle lens and within a few feet of Williams enabled the incorporation of the starburst electrolier, making it an essential element of the photograph. 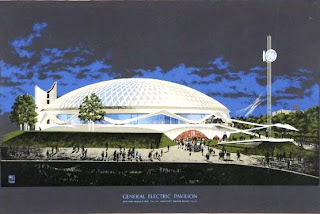 The resulting image conjured the essence of the space-age future for everyone who has ever flown into or out of Los Angeles or have only seen the photo. While helping to create an icon, as have hundreds of his images, Shulman's Theme Building photograph became an icon in and of itself. Whether a conscious decision on Aschheim's part or not, the iconography of Shulman's image above literally demands that the electrolier appear in her Theme Building No. 3 below. Left, Deborah Aschheim, Theme building No. 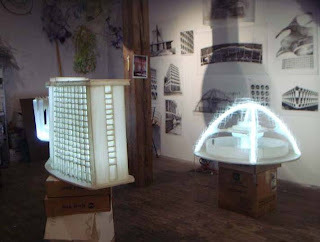 3 (With Asterisk Lamp and Palms), 2010. Right, Gary Winogrand, Untitled (Los Angeles International Airport), circa 1964. Gelatin silver print. Other artists such as photographer Gary Winogrand presciently recognized the Theme Building as a subject with iconic potential. His ghostly 1964 untitled image (above right) from close to the same perspective as Aschheim's drawing (above left) was included in the 1989 J. Paul Getty Museum exhibition Experimental Photography: The New Subjectivity and evokes nostalgia for a close "encounter" of the third kind and along with Shulman's image was a great contribution to the zeitgeist of modernist Los Angeles in the 1960s. Note the hint of the staburst electrolier in the upper left hand corner. Neptune's Courtyard, theme building and entrance to Pacific Ocean Park, circa 1958. Photographer unknown. (From Paradise by the Sea: Santa Monica Bay by Fred E. Basten, Hennessey + Ingalls, 2000, p. 197). 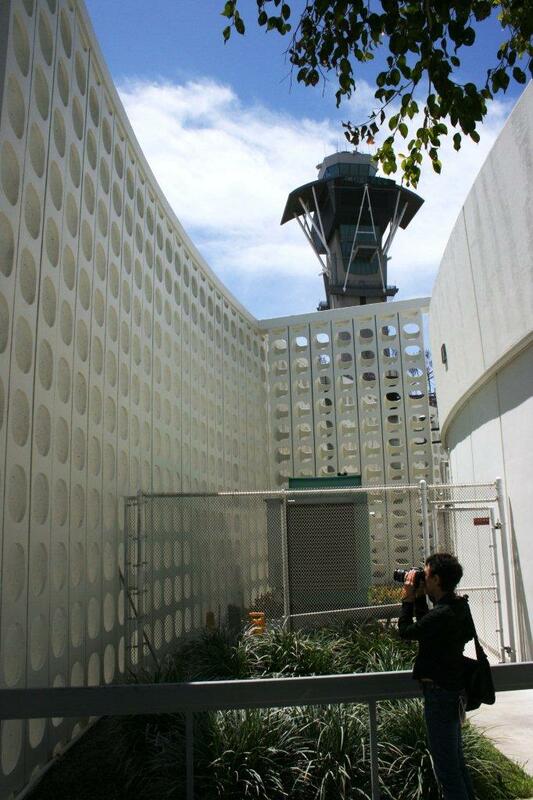 One can't but help think that the architects for the LAX Theme Building were inspired by Pacific Ocean Park's Neptune's Garden Theme Building in Santa Monica which opened in the summer of 1958. 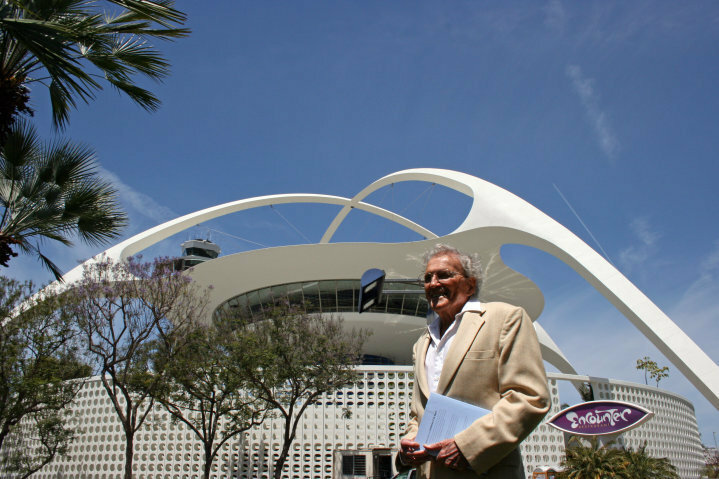 Bradshaw played a major role in the final design of the LAX Theme Building by solving some very complex structural issues that made construction a reality. 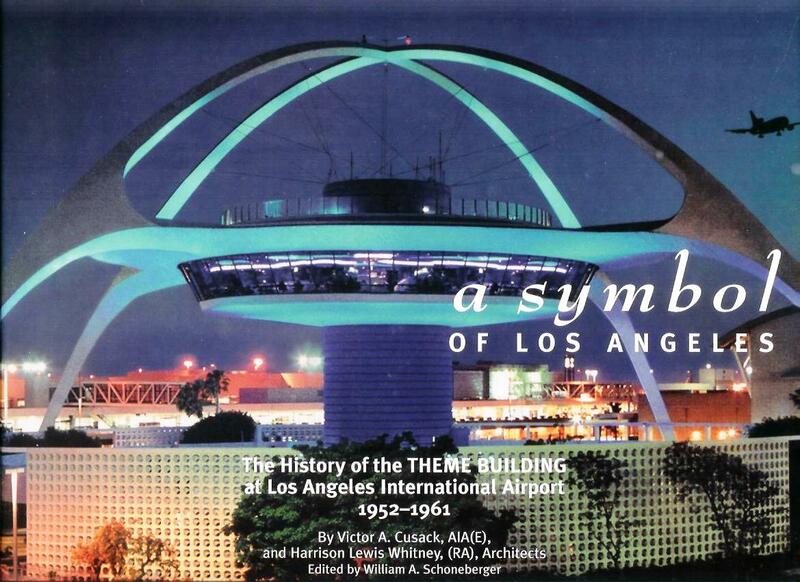 The definitive book on the history of the design of this most important Los Angeles icon is A Symbol of Los Angeles: The History of the Theme Building at Los Angeles International Airport, 1952-1961 . (See below). 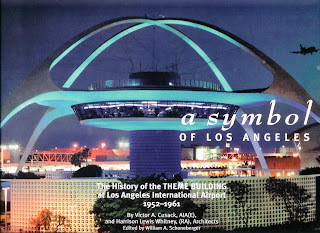 The extremely well-documented book written by Victor Cusack and Harrison Lewis Whitney and edited by William A. Schoneberger includes numerous drawings, renderings, construction photos and ephemera giving the most complete documentation of the design and construction as one is ever likely to find and is for sale at the Flightpath Learning Center at LAX. After working up an appetite during the photo shoot, we all went to lunch at the Encounter Restaurant. Just as I suspected, Deborah and Richard had an eerie amount of work in common as both of their oeuvres are concerned with the skeletal and neural essences of the completed structure. They are kindred design spirits in the truest sense. 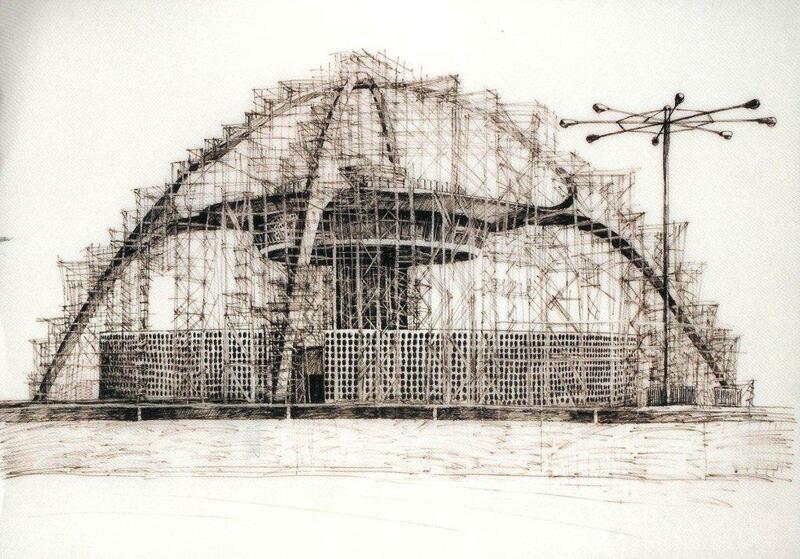 Deborah discussed having to employ a structural engineer to aid in the design and installation of her intricate neural architecture sculptures (see example below) just as a global cadre of modernist architects relied upon Bradshaw's services to accomplish their creative aims. As we thumbed through Richard's marketing book during lunch we discovered an amazing number of projects which had inspired drawings by Deborah which will be included in her solo exhibition and which I will touch on later. Richard had enthralling stories to tell about the design difficulties of each project and we could have gone on for hours. 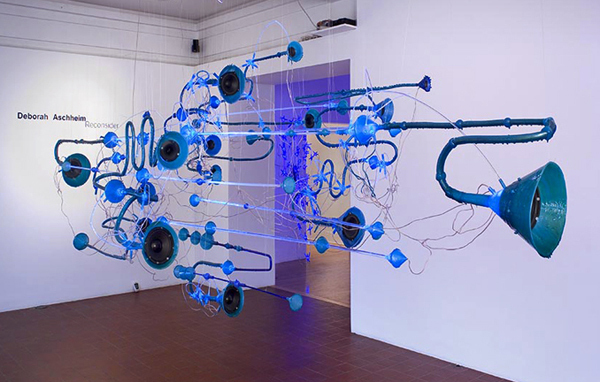 Deborah Aschheim, "Earworm" (node), 2008, speakers, LED's, plastic, copper tubing, 2008. 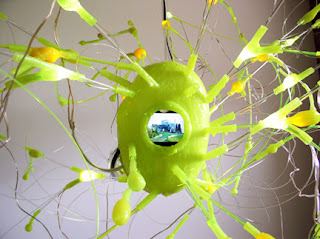 Go to the following link for a 13 second movie of Aschheim installing another complex sculpture Neural Architecture No. 6 and view some of her other very exciting neural architecture in her Reconsider Exhibition Catalog at the end of this article. A review of this extremely cerebral exhibition can be read at "Earworms". 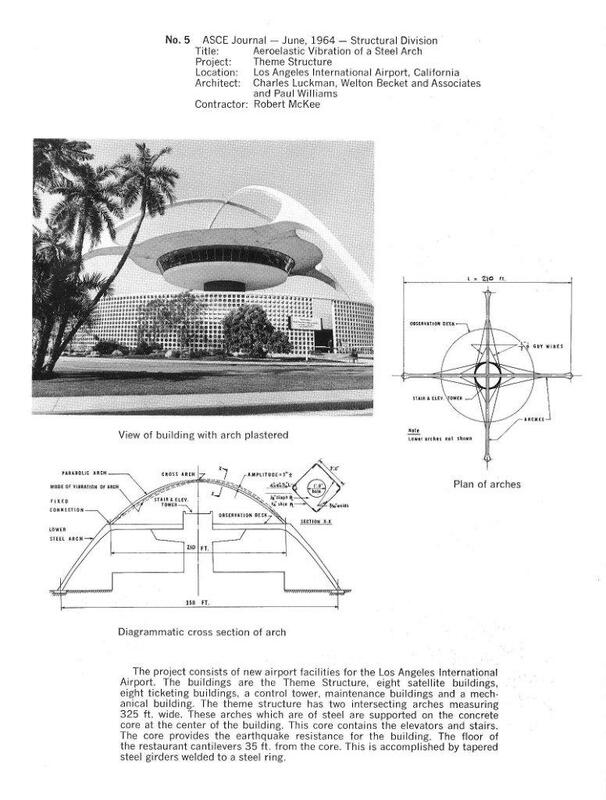 Theme Building page from Richard R. Bradshaw, Incorporated, Structural Engineers marketing book. Courtesy of Richard Bradshaw. 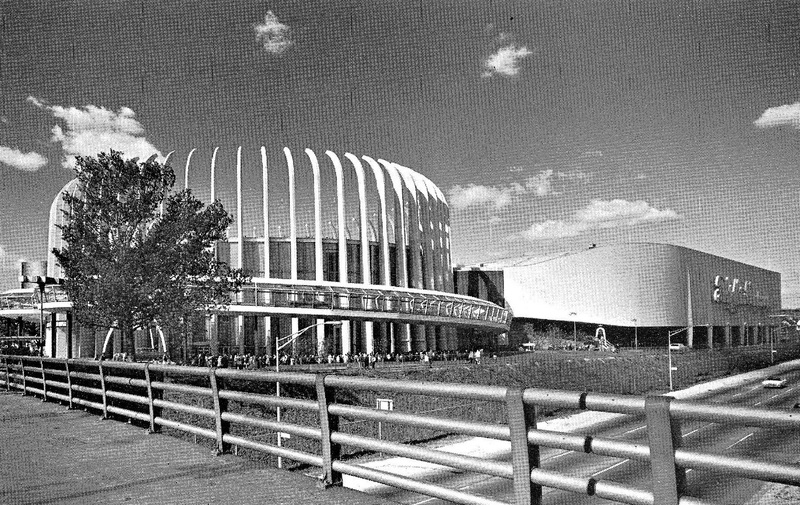 The most interesting anecdote shared by Bradshaw was the problem of wind-induced harmonic resonance which surfaced during construction of the Theme Building. Wind of a certain velocity and direction set up harmonic vibrations in the steel superstructure as illustrated in the cross-section above. 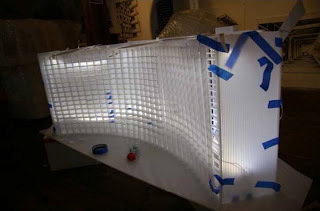 Richard had to create a dynamic field test to determine whether the stucco sheathing to be installed around the four spider legs of the building would totally dampen the vibrations. He and his team applied pressure to one of the legs by attaching a cable and cranking down on it and then quickly releasing it to determine the amplitude and force of the vibrations and was able to determine that the design would work. These daring design challenges are what Bradshaw lived for. Left, Deborah Aschheim researching for upcoming show at the Cella Gallery, May 25, 2010. Photo by John Crosse. Right, Deborah Aschheim, Encounter No. 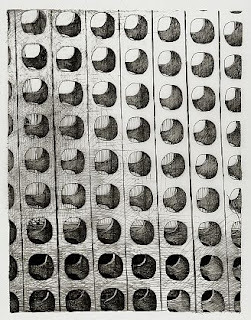 3 (Something Sensuous About the Grid of Holes), 2010 Ink on Dura-lar, 30 x 23 inches. From left, Joe Kinishita, Jim Santiago, Richard Bradshaw, Don Belding, Welton Becket, Paul Williams and Don Wilcox, ca. 1959. From A Symbol of Los Angeles, p. 85. Photographer unknown. Theme Building construction photo, 1960. Photographer unknown. 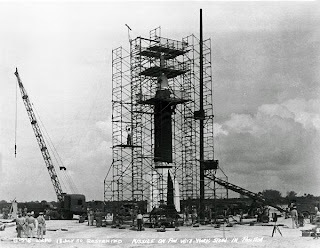 Recently running across the above Theme Building construction photo conjured in my mind a space shot being readied at Cape Canaveral about the same time the above construction was taking place. 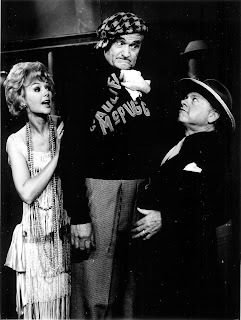 I Googled Cape Canaveral and quickly found the image below. Talk about the power of nostalgia! 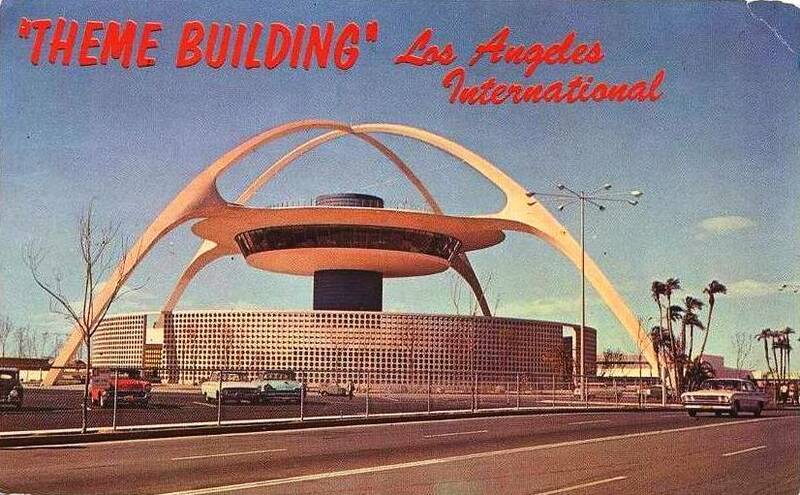 Bradshaw and the Joint Venture boys must have had great fun creating this masterpiece of modernism. 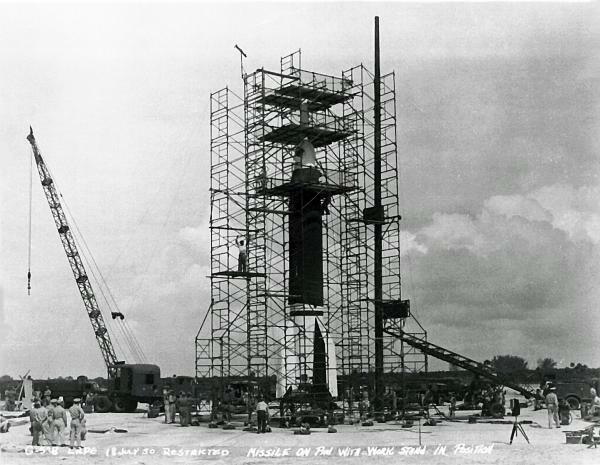 Launch preparations at Cape Canaveral circa 1960. Photographer unknown. Theme Building structural steel and scaffolding ca. 1960. From A Symbol of Los Angeles, p. 71. Photographer unknown, courtesy of Richard Bradshaw. Aschheim states, "When I was growing up, the future was limitless possibility, jet-age, space-age, techno utopia. 'Modern' meant new. Now, modern means old and the future I grew up with seems dated, irresponsible, and obsolete." 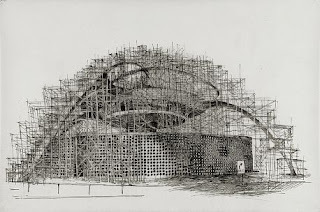 Her initial attraction to the Theme Building came as she continued to view the preservation scaffolding wrapping the iconic structure during the last two years as she jet-setted around the country for her various shows. Bradshaw not only designed work for the superstructure for the Theme Building, he also created the thin-shelled concrete roofs, his world-recognized specialty, for the adjacent maintenance garages seen below. 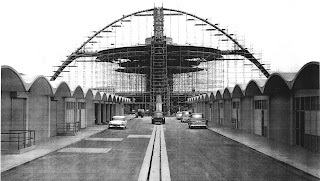 Construction photo of Theme Building and maintenance garages ca. 1960. Photo courtesy of Richard Bradshaw. Photographer unknown. I couldn't wait to send the above photos to Deborah to let her know her instincts were right on as to the scaffolding's role in creating a sense of mystery and timeless nostalgia. 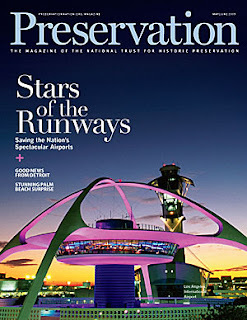 It also had the pragmatic affect of enabling preservation of the most-recognized landmark of Los Angeles documented in a recent issue of Preservation Magazine seen below. Preservation Magazine, September 2009 cover story on the preservation project for the LAX Theme Building. Much of Deborah's work in her Cella show was inspired by the 1964 New York World's Fair. 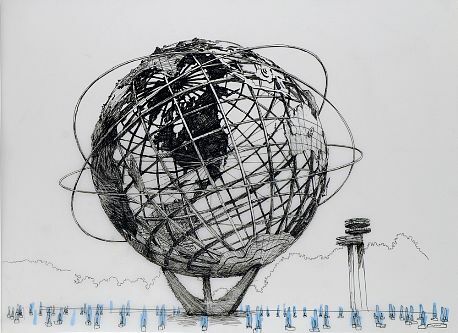 She made drawings and created a model of the New York Pavilion (Tent of Tomorrow) and the Unisphere. 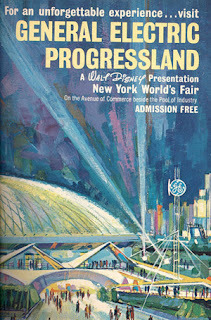 Unbeknownst to her, some of Bradshaw's most iconic designs, the multiple award-winning General Electric and Ford Motor Company Pavilions were also major features of the Fair and were widely published to much critical acclaim. 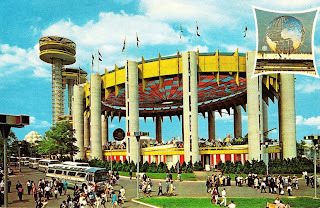 Postcard of the New York Pavilion and Unisphere, New York World's Fair, 1964. Left, Deborah Aschheim, Tent of Tomorrow, 2009, plastic and LED’s. 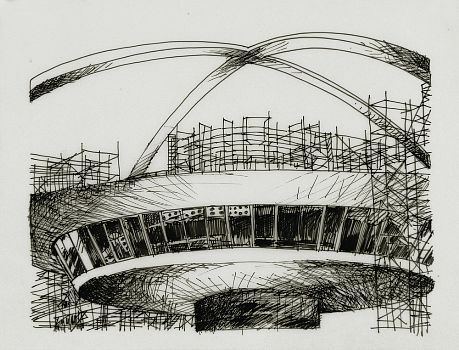 Right, unbuilt domed stadium, Richard Bradshaw for Welton Becket & Associates. 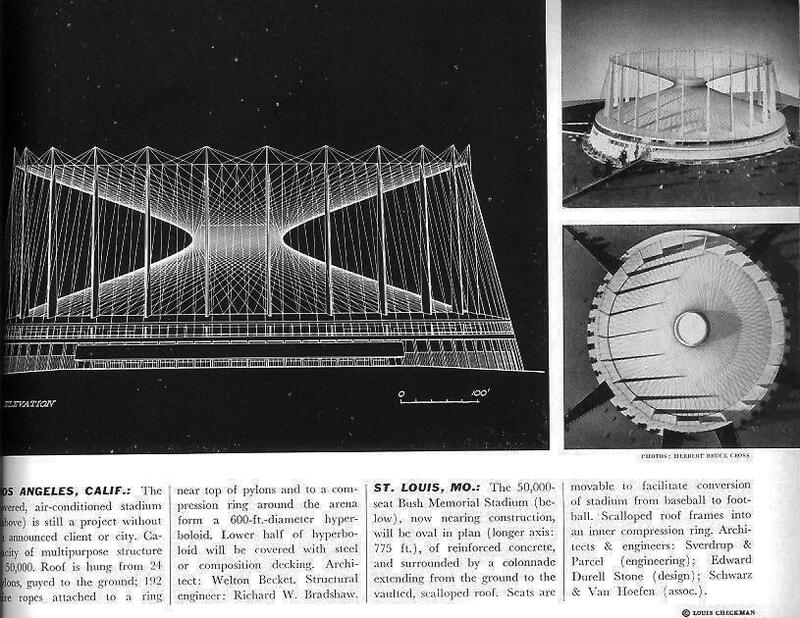 From an unknown issue of Architectural Record ca. 1965. Courtesy of Richard Bradshaw. Aschheim's model and drawings of the New York Pavilion at the 1964 New York World's Fair echo Bradshaw's unbuilt hyperbolic-paraboloid stadium design for Welton Becket & Associates using remarkably similar design elements. 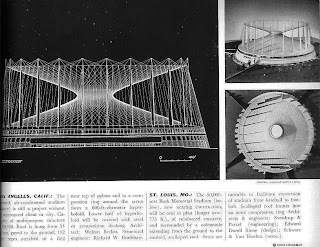 Becket was trying to break into the fledgling domed stadium market and commissioned the above right stadium design from Bradshaw in 1964. 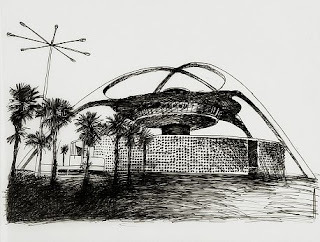 Deborah Aschheim, Unisphere (I See in My Mind Mom in Front of it Looking Like Jackie Kennedy), 2009, Ink and acrylic on Dura-lar, 25 x 34 inches. General Electric Pavilion, New York World's Fair, Welton Becket & Associates, Structural Engineering by Richard Bradshaw, 1964. Photo courtesy Richard Brashaw. Carlos Diniz, General Electric Pavillion - New York World's Fair 1964-65, 1965, Serigraph on paper, 40 x 26 inches. Courtesy Edward Cella Gallery. 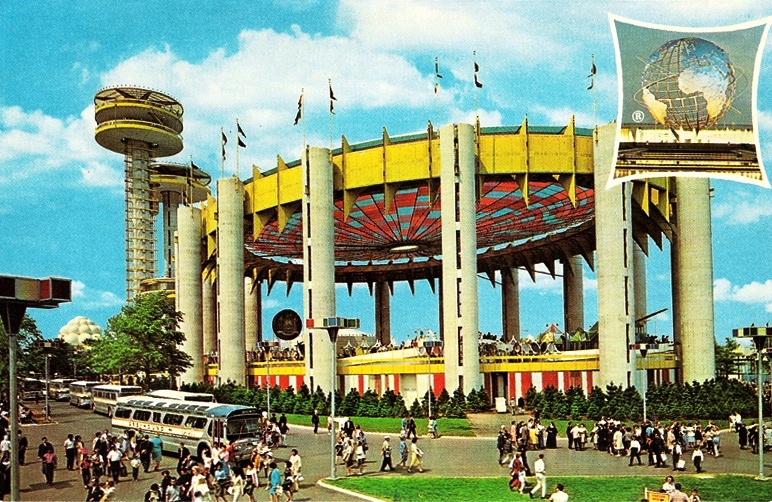 Ford Pavilion, New York World's Fair, Welton Becket & Associates, Structural Engineering by Richard Bradshaw, 1964. Photo courtesy Richard Bradshaw. Aschheim's Unisphere and Bradshaw's G.E. 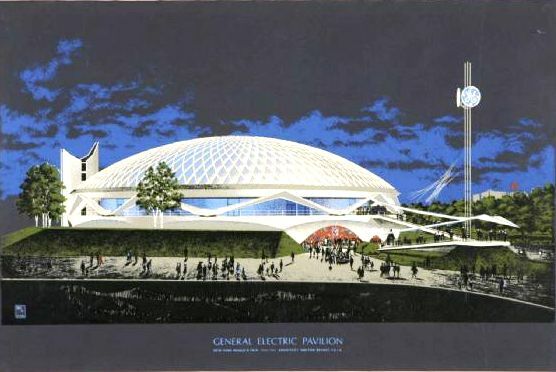 and Ford Pavilions above round out their Fair-inspired production. 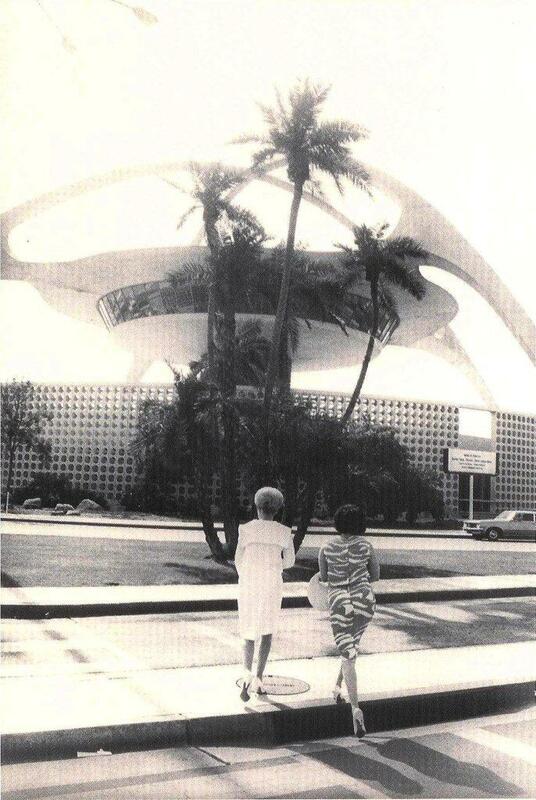 Left, Gulf Life Insurance Building, Welton Becket & Associates, Structural Engineering by Richard Bradshaw, 1968. Courtesy Richard Bradshaw. Right, Deborah Aschheim, Gufl Life, 2009. 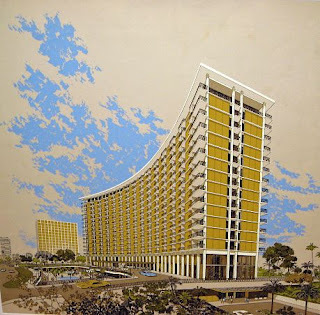 Bradshaw's above left photo of the Gulf Life Building in Jacksonville, Florida elicits the unbridled spirit of the modern skyscraper at the peak of the Modern Movement during the mid-1960s. It is coincidental that Becket & Associates, a firm whose work has inspired much of Aschheim's, called upon Bradshaw for the firm's most challenging design projects. The exterior frames are precast, post-tensioned sections. The floors are composed of prestressed concrete T-beams. 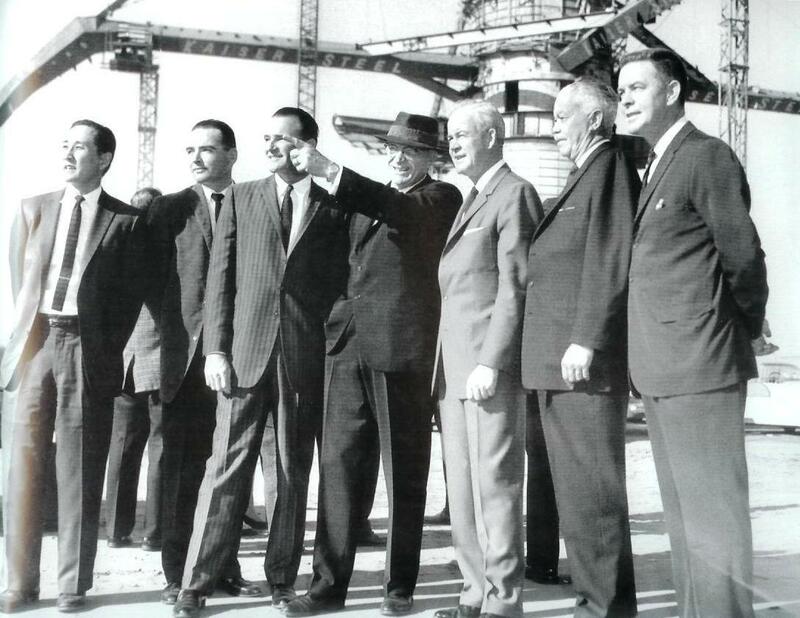 At the time the 27-story concrete shear wall structure was built in 1968, it was the tallest precast prestressed building in the world, just the kind of challenging project Bradshaw sought out his entire career. 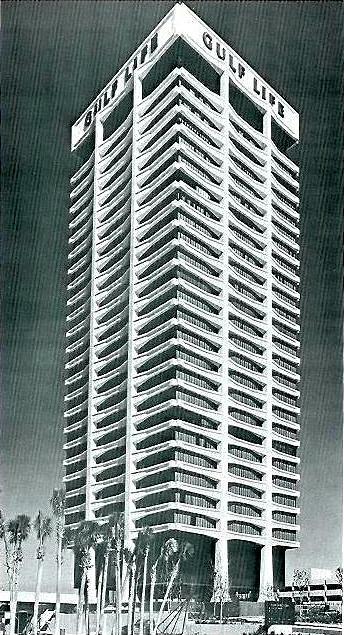 The building garnered for Richard the Prestressed Concrete Institute Honor Award for 1968. Bradshaw is also not too shy to relate that the architects in the Becket offices thought he was a genius. Many projects completed by Welton Becket & Associates appear to trigger a deep nostalgic response in Deborah's psyche. 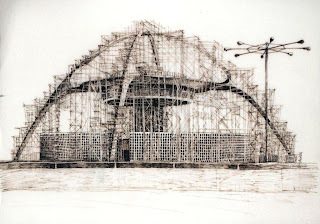 Her above right drawing of Gulf Life, enshrouds the building in scaffolding and evokes wrapping ourselves in a blanket to protect the modernistic memories of our youth. Ironically, at the May 25th Encounter luncheon, Bradshaw regaled us with a story of how a major repair had to be made to all four corners on each of the 27 stories which required a creative solution akin to to wrapping the building in scaffolding as above. If you attend the opening, don't forget to ask Richard to share this anecdote with you as he is looking forward to being in attendance. 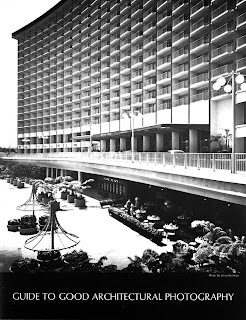 Another building which evoked Aschheim's "Nostalgia for the Future," not to mention that of the Los Angeles Conservancy, is Minoru Yamasaki's Century Plaza Hotel. This building serves as an extremely interesting case study on the importance of preservation of our icons to our psyche's mental health. Architects take note. Images in any form are essential in the quest to save your structures from the wrecking ball. 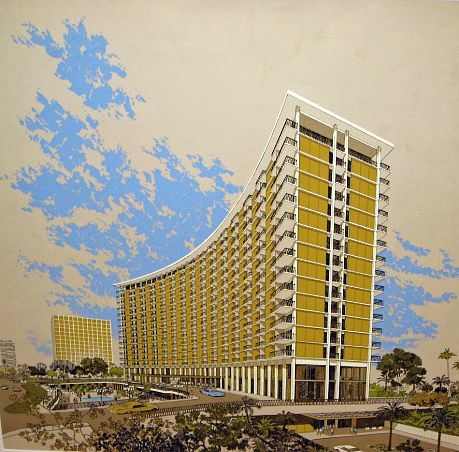 Yamasaki had the foresight to engage Carlos Diniz to create the below fabulous presentation drawing (see below) for the hotel to help sell it to Century City's developers. 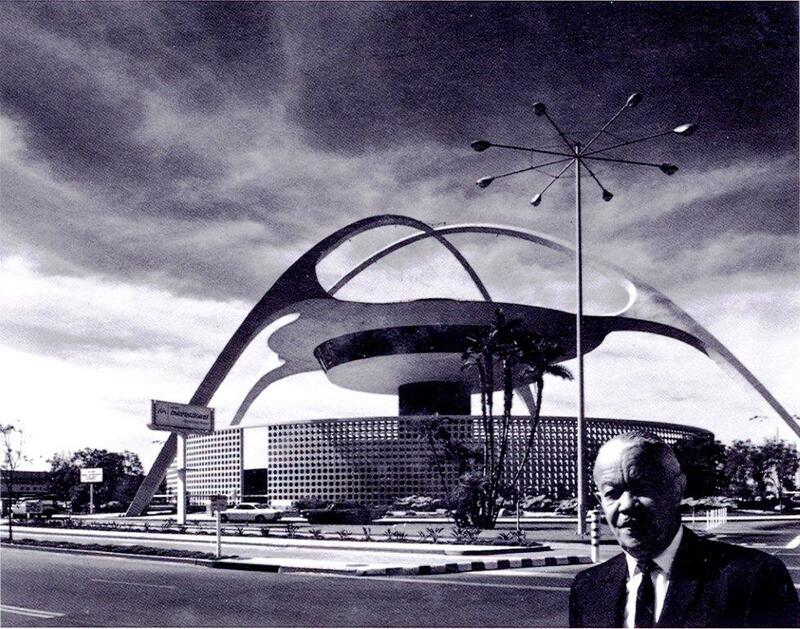 Upon completion he then commissioned Julius Shulman to photograph it, almost guaranteeing it iconic status. (See further below). Had he not had the foresight to do that, I think most would agree that it is unlikely the building would have been saved. 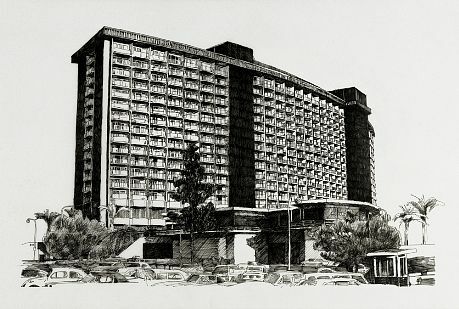 Carlos Diniz, Century Plaza Hotel - View of Tower, 1964, Silkcreen on paper, 25 1/2 x 25 1/4 inches. Courtesy Edward Cella Gallery. 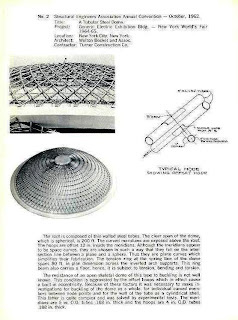 Guide to Good Architectural Photography, Architectural Record Special Supplement, 1966. 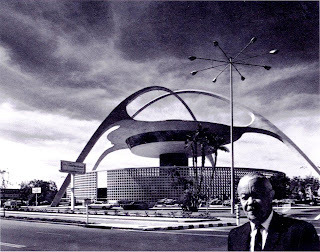 Julius Shulman cover photo, Job No. 3997, March 3, 1966. © Julius Shulman Photography Archive, Research Library at the Getty Research Institute. Deborah Aschheim, Century 2010 (After Dad's 1968 California Vacation Slides), Ink on Dura-lar, 25 x 40 inches. 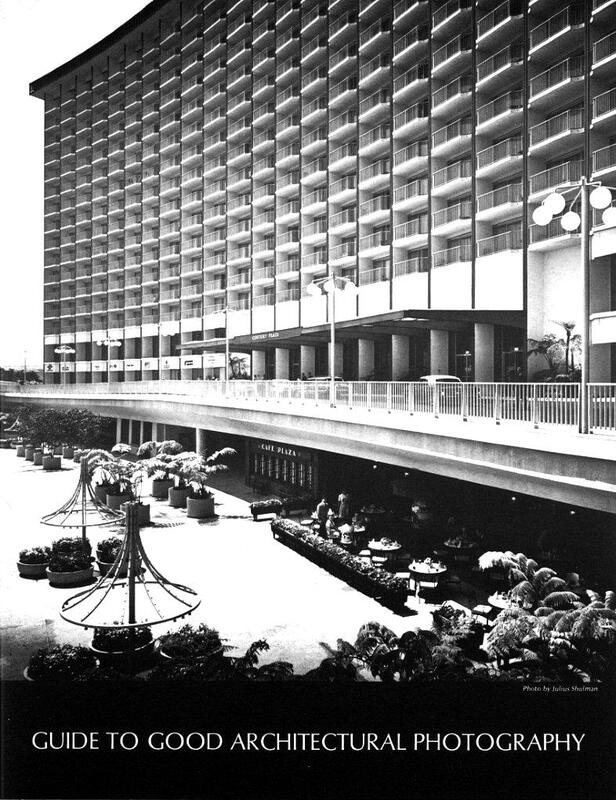 Aschheim's parents stayed in the Century Plaza during 1968. Her father's vacation slides were also important in ingraining the beauty of this 1960's icon into Deborah's memory which is now resurfacing in her work. Her model and drawings are an important addition to the body of art which will continue to increase the critical mass of our nostalgia for this important landmark and the others in her show. The Los Angeles Conservancy would do well to put Deborah on the payroll full-time and trust her uncanny instincts to discover more of our collective "Nostalgia for the Future." 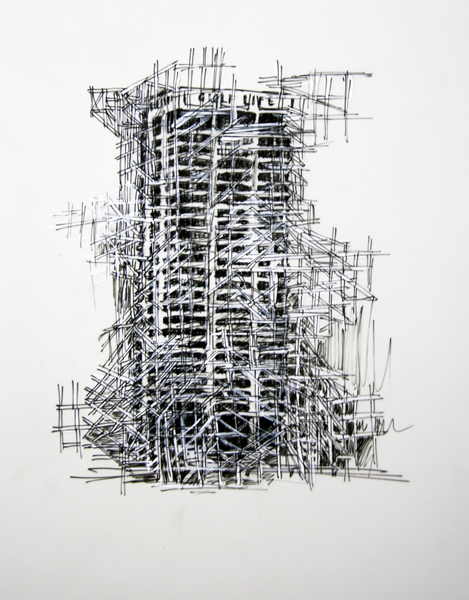 Deborah Aschheim, Century 2010, work in progress, Aschheim studio. Photo by Deborah Aschheim. The images above resurfaced my personal nostalgia for this icon as I have many fond memories of attending heated Viet Nam War protest rallies in front of the hotel in the late 1960s shortly after it opened for business.With its relative isolation in Century City, it was the preferred watering hole for visiting dignitaries and politicians such as Ronald Reagan and Lyndon Johnson as the police found it quite easy to defend from protesters. That certainly didn't stop us from trying as we filled the fountains of the establishment's bastion with red Koolaid to evoke the blood spilled during the war. There were some very dramatic cat-and-mouse games between the police and us radical, pot-smoking "Hippies" back in the day. (See below). 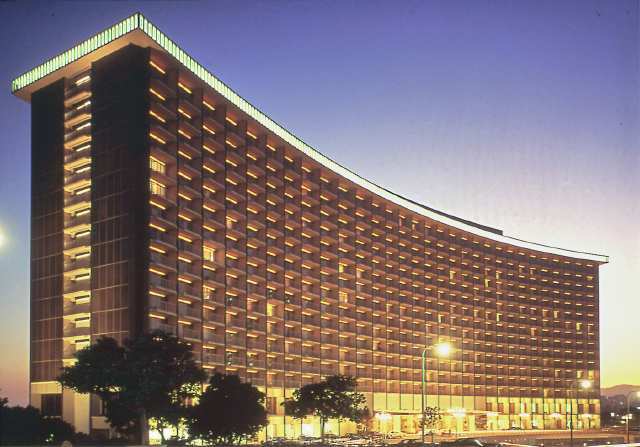 I did not really come to appreciate the hotel's architecture until about 10 years ago when I ironically started attending the annual California Antiquarian Book Fairs to search for material on the the history of Southern California modernist architecture. I took a real close look around the facility during last February's Fair and found the crisp, clean architecture as aesthetically pleasing as if it was new. I rejoice that it will be saved even though we wished a completely different fate for it in the 1960s as we mourned the loss of Bobbie Kennedy and Martin Luther King. 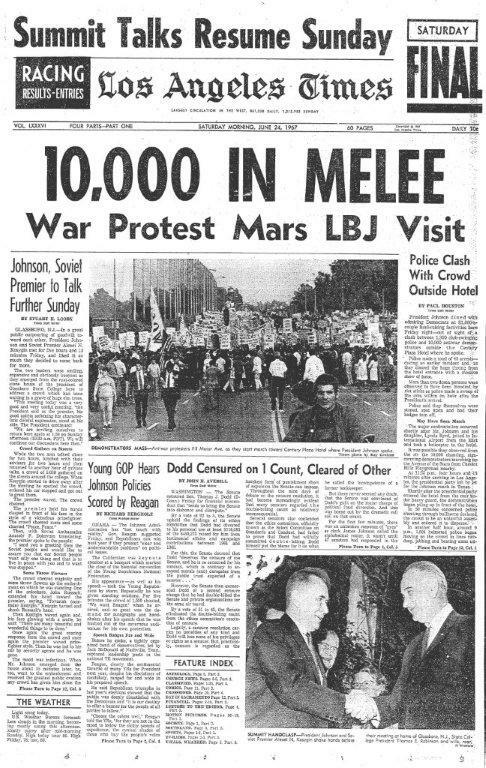 Los Angeles Times, June 15, 1967, p. II-1. From ProQuest. 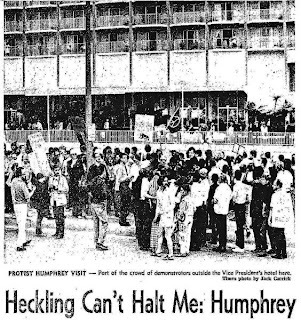 Los Angeles Times, June 24, 1967. From ProQuest. 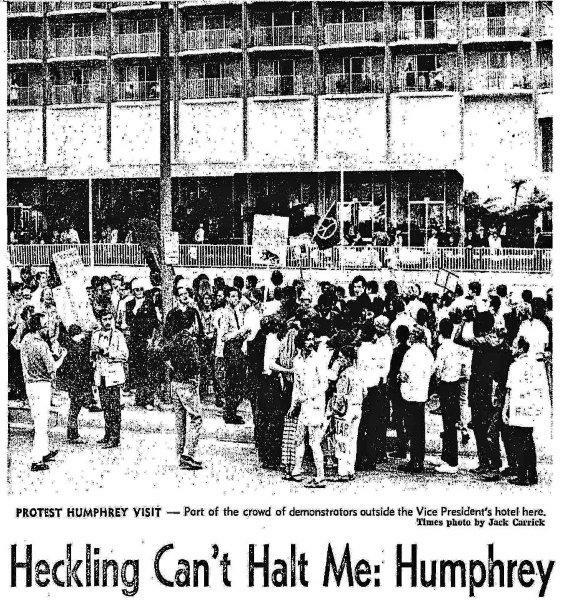 Los Angeles Times, July 28, 1967. From ProQuest. Aschheim writes in her statement for the exhibition, "I have been urgently seeking out the buildings before they are erased. I don't want to go inside the buildings. I circle them, trying to understand them before they are removed or renovated into the present. It is a strange way to feel about architecture. Working from memory and from photographs I take on my visits, I am drawing them and building them, somewhat inaccurately and not to scale, sometimes entombed in clouds or scaffolding. ... The buildings are landmarks at the intersection of two worlds: the elusive, private space of memory, and the contested space of bodies and the built environment." Royal Hawaiian Hotel Addition, Wimberly, 1969, Whisenand, Allison, Tong & Goo, Structural Engineering by Richard Bradshaw, photo by Walton Photography. Courtesy Richard Bradshaw. 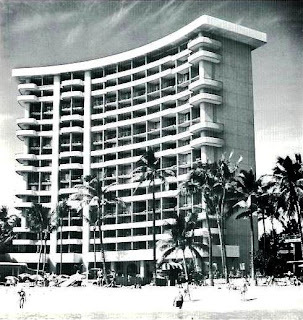 Richard Bradshaw, coincidentally, worked on hundreds of hotels around the world, specializing in Hawaii with his WWII pal, architect Pete Wimberly, a classmate of A. Quincy Jones and Minoru Yamasaki in the late 1930s at the University of Washington. Below is an intriguing profile of Richard and his career published in the April 29, 1962 issue of the Los Angeles Times. It gives you the sense of the man's deep desire to learn all there was to learn about the field/art of structural engineering and to translate his complex equations and calculations into the elegant designs seen herein. 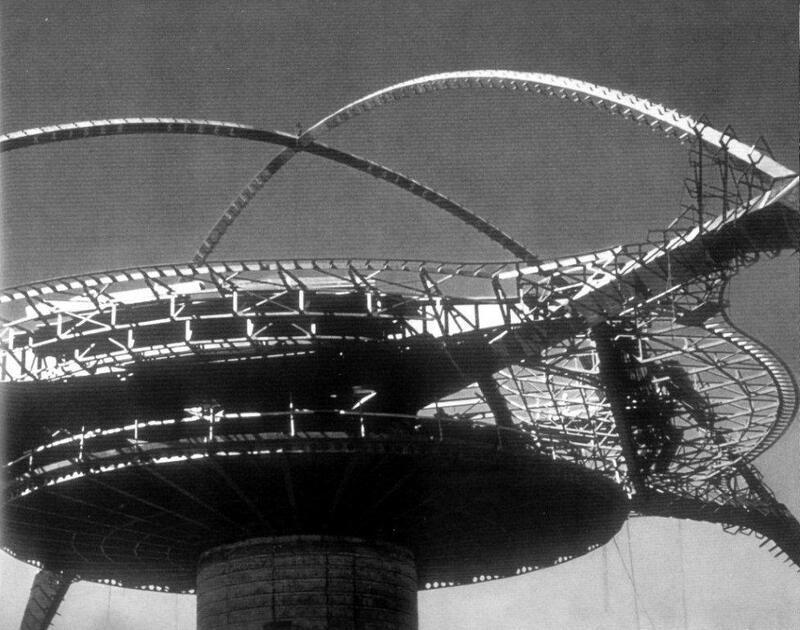 Nearly fifty years after this article was written, Bradshaw is still trying to solve ever more complex structural problems with a new sophisticated structural engineering software package he recently installed on his powerful Apple computer. Thom Mayne and Frank Gehry, do you need any help? Profile on Bradshaw from the Los Angeles Times Real Estate Section, April 29, 1962, p. 2. From ProQuest. Richard Bradshaw model of McCarran Field Terminal, Las Vegas for Welton Becket & Associates. Courtesy of Richard Bradshaw. 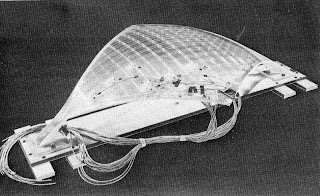 Much of Bradshaw's design work could not be found in the structural engineering textbooks and since it was before the age of powerful computers and sophisticated design software programs, he had to be creative to find solutions. By using complex stress-testing of design models equipped with strain gauges and other innovative techniques and adapting aeronautical engineering techniques to building design, he was able to determine how the structural forces between the interconnecting materials of concrete and steel might react to exterior and interior forces of nature, dynamic interior loading and aging. Add some LED lighting to the above manta ray-shaped model of McCarran Field Terminal in Las Vegas (see below) and it would make a great accompaniment to Aschheim's show. 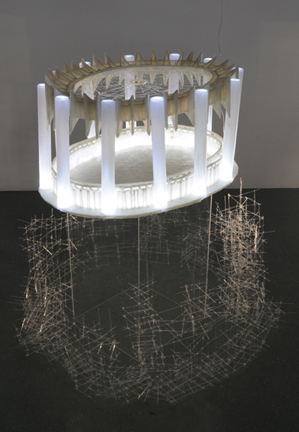 Read the Scarlet Cheng review of Deborah's exhibition "Rework, rebuild, recycle" at the Ben Maltz Gallery at Otis College of Art and Design to discover eerie similarities between her Neural Architecture Series and Bradshaw's design models. McCarran Field Terminal, Las Vegas for Welton Becket & Associates. Courtesy of Richard Bradshaw. Bradshaw's most recent lecture was titled "Structural Elegance" and was presented at the 2008 National Conference of the American Society of Civil Engineers. The following excerpt from the abstract gives one the sense of the his design philosophy. "The use of the expression Structural Elegance should be used more often to describe excellence in Structural Engineering. 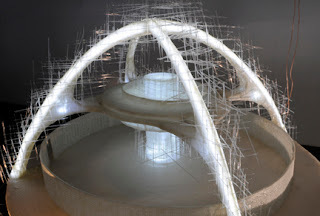 Only Structural Engineers are qualified to decide which structures possess the quality of Structural Elegance: The attributes which define the expression are herein discussed. Structural aesthetics are a part, but only a part, of Structural Elegance. It is possible to have structural elegance without aesthetics. Many structures today are built on whimsical structural decisions rather than on classical methods. Structural Elegance also includes a clear sense of purpose, efficiency of materials and construction methods and lastly, daring." "As we have seen, the tragic events on September 11, 2001 changed the world immediately and forever. 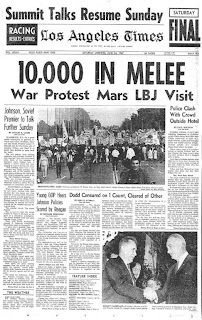 It threw the United States into a patriotic maelstrom that included a strategic erosion of the Bill of Rights and a move to suspend the writ of habeas corpus. It spawned a never ending, bankrupting war, and it continues to fuel an obsession with safety by perpetuating a steady media diet of anxiety and fear. What Aschheim observed shortly after 9/11 was the pervasive use of fear mongering words like invasion, terrorist, and contagion creating a hysterical need for a feeling of protection. This lead to the public's demand for (and the subsequent availability of) affordable surveillance equipment to protect against invasions - a placebo like sealing your windows with duct tape. The access to new surveillance equipment proved beneficial for Aschheim: before the attacks, she was exploring the possibility of using light and motion sensors in her installations, but the incorporation of these products proved exorbitant because the technology had to be hardwired into the building and installed by professionals. But by the end of 2001, Home Depot, Target, Wall Mart and other big box stores had "Home Security" aisles filled with affordable plug-and-play motion, light, and audio sensing devices. No longer the sole purview of the property owner; this technology was now made available to all. 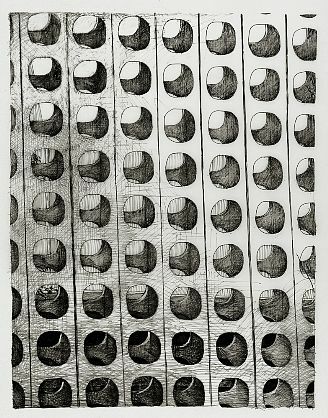 Her access to this technology permitted her to narrow her focus from the entire body to the intricacies of the human nervous system resulting in the creation of Neural Architecture." Join Linton and Tom Leeser on September 25th and Margo Bistis and Norman M. Klein on October 16th for the special Gallery Exhibition Programs below. Join Meg Linton and Tom Leeser as they discuss Nostalgia for the Future with artist Deborah Aschheim. Leeser and Linton bring their unique perspectives as artist and curator, respectively, in opening dialogues about memory, modernism, and our conceptions of the misremembered future. 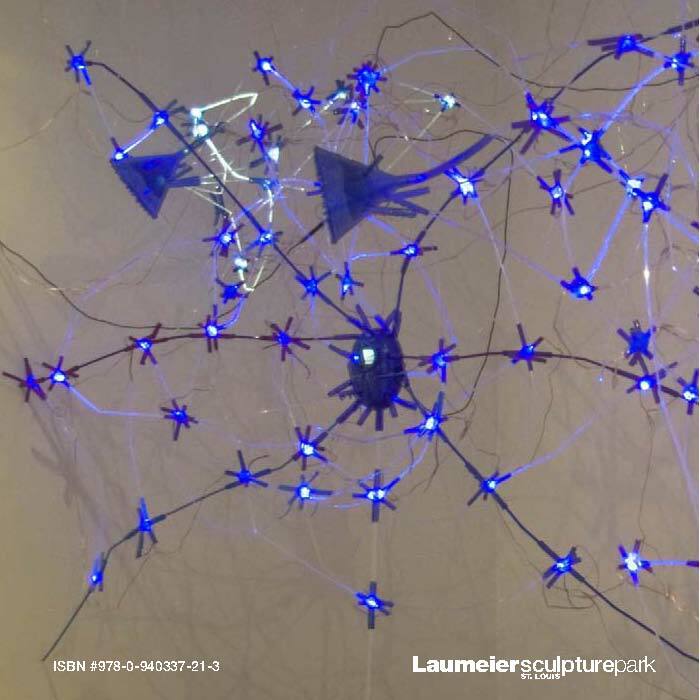 Both Leeser and Linton have included Aschheim’s work in recent exhibitions at the Ben Maltz Gallery and the Museum of Jurassic Technology. Meg Linton is the Director of Galleries and Exhibitions, Ben Maltz Gallery, Otis College of Art and Design in Los Angeles. 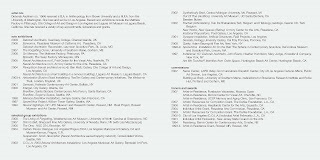 Over the last sixteen years, she has organized hundreds of solo and group exhibitions and published dozens of catalogues. She received degrees from the University of California at Irvine and California State University, Fullerton, and completed the prestigious Museum Leadership Program at The Getty Leadership Institute. 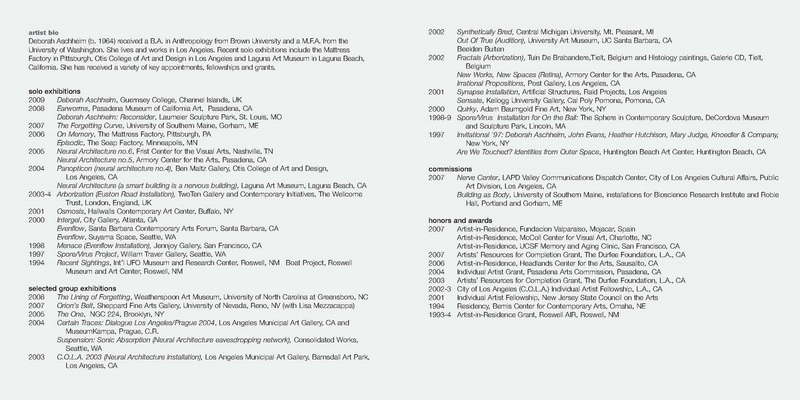 Her previous curatorial positions include the Santa Barbara Contemporary Arts Forum and University Art Museum at California State University, Long Beach. Tom Leeser is the Director of the Center for Integrated Media at CalArts and has been active in the field of art and technology for over twenty years as a digital media artist, writer, educator, and curator. 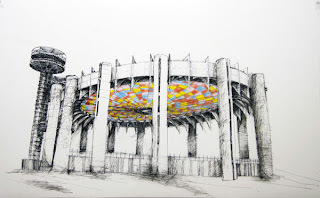 A graduate of the San Francisco Art Institute, his work has been exhibited at MassMOCA, Santa Monica Museum of Art, the Kitting Factory, and film and video festivals nationwide. All buildings speak to power, simply in the way that they are designed and constructed. 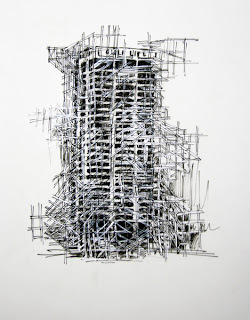 The process of putting up a building is a narrative that leaves traces. Join Norman Klein and Margo Bistis as they discuss a collective unconscious of architecture and cities, and what modernist buildings can tell us about our catastrophes today. Margo Bistis is a European cultural historian, independent curator, and teaches in the School of Critical Studies at California Institute of the Arts. Her publications include essays on Henri Bergson, modernism, and caricature. In 2003, she assisted in the curating of Comic Art: The Paris Salon in Caricature at the Getty Research Institute. Don't miss this opening! It will be a very fun event with a great cross-section of artists and architects in attendance. The soon-to-follow gallery talks will also be prove to be very interesting if Edward's past events are any indication. Outside In: The Architecture of Smith and Williams, UC-Santa Barbara Art Museum, April 13 - June 16, 2013 and "Smith & Williams: An Annotated Bibliography"